Through the grey April sky there seems to be a sun beam trying to fight it’s way through and feed us with some vitamin D – I hope it’s the same where you are too. The Silver Jews I sneaked in to let off some steam. Enjoy! On this Day Martin Luther King delivered his ‘I’ve Been to the Mountaintop’ speech. 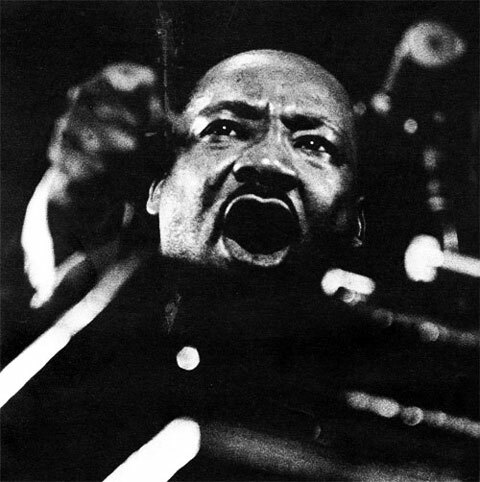 King made the speech one day before his assassination on the 4th April, 1968 at the Mason Temple in Memphis Tennessee. King called for unity, economic actions, boycotts, and nonviolent protest, while challenging the United States to live up to its ideals. At the end of the speech, he discusses the possibility of an untimely death. we aren’t going to let dogs or water hoses turn us around. We aren’t going to let any injunction turn us around. We are going on. strives with fervent determination and just a smidgen of good old-fashioned leuve. enjoy. The first ear-connection I had with Heartless Bastards was on 6 Music. Erika Wennerstrom’s voice blew me away as it is undeniably ‘different’. I think you either love or hate it. Myself and 33,754 others (facebook fans alone) love it. I managed to catch their one-only gig in Switzerland a couple of months ago and Erika Wennerstrom’s voice didn’t seem to match up with her slight frame – A deep, southern, fine-sand-paper twang full of fragility – like it’s just about to break. They played hard to a semi warm appreciative audience and It reminded me again, how much dedication, bloody-mindedness, stubborn determination and a soupscon of madness you have to have to arrive at your goals in the music business. Their sound to me is a mix of grey-granite rock, wide-open prairies, mountain ranges, pools of blood, sweat and tears and heart-ache. They have been likened to The Black Keys- who are fellow Ohioions. The Heartless Bastards had different line-up at the very beginning in 2003, with Erika Wennerstrom on vocals, piano and guitar, Dave Colvin on drums, Adam McAllister on bass and Michael Weinel on lead guitar. They played their first live show at The Comet bar in Cincinnati 2003 and have meandered their way through the circuits and festivals ever since. The present day members are Erika Wennerstrom, Jesse Ebaugh (bass), Dave Colvin (drums), and Mark Nathan (guitar). They’ve now got their fourth album Arrow (2012) under their belts and it’s not one to miss. Check them out on: www.theheartlessbastards.com Here’s a taster of their brilliance: Nothing Seems The Same, live at SXSW.